Enerklean offer a wide range of renewable energy solutions backed by expertise in commercial and residential energy efficiency. Wind and solar power provide a renewable energy solution to businesses and industries seeking a non-polluting, reliable and clean source of energy. 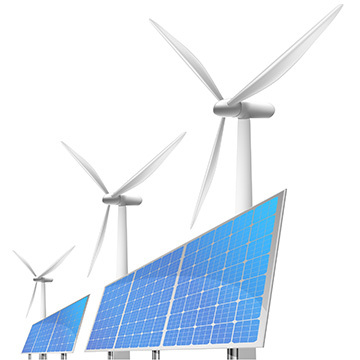 Enerklean has the capability to offer comprehensive tailor-based renewable energy solutions with proven track record. As an expert in project management, we have the resources available to manage both medium and large-scale renewable energy projects. We also work with businesses to determine their energy requirements before identifying an energy efficiency program that best suits their budget and sustainability plan. We co-operate with leading businesses operating in solar power, wind power, energy efficiency and energy storage to deliver the best possible service to our clients. Enerklean only supply equipment from reputable Tier-1 manufacturers to ensure that our customers receive the best equipment on offer. At Enerklean, we constantly update our product knowledge to bring the latest technology and insight to our clients. Our experienced engineers are experts in renewable energy solutions, and can answer any questions you may have along the way. Enerklean work with clients to help determine the renewable energy system that best suits their needs. From household solar power systems to large-scale utility solutions, we offer a range of customised renewable energy solutions to match the requirements of Australian homes, businesses and industrial projects.